Okay, that’s a bad pun, but, eh. I am still behind from returning from vacation. Sorry:( Hope “Wrath” makes ya happy! Ha! I bet if ‘Wrath’ knew he was making us (or anyone) happy that would make him twice as angry. Good thing for us he’s on the other side of the fourth wall. (warning, esoteric theory ahead, please reduce speed): If ‘Wrath’ could cross the fourth wall he would be in our world, where magic doesn’t work (according to most theories). The shard would not affect him while he’s here and he would revert to his normal, friendly personality. 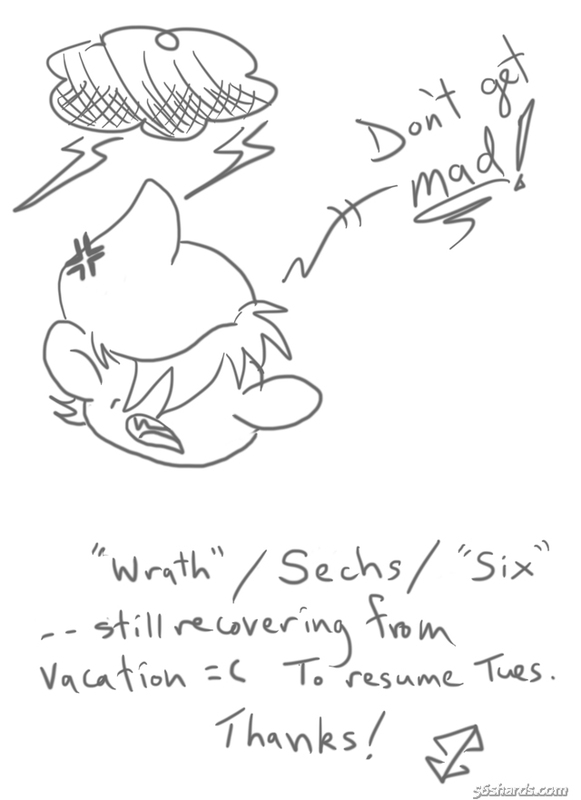 Then, however, Sechs wouldn’t want to cross back and resume his role as ‘Wrath’. This would probably force a rewrite of the whole rest of the story. I wouldn’t wish that on Jade, and anyway I do want to see the rest of the story as currently planned. I like to make my characters at first seem one-dimensional and twist that and add to it in different ways. The seven dwarfs show this in some ways but the main SHARDS characters do it better justice. If I were to make “Wrath”/Sechs a main character, he would be opened up layer by layer as well:) That won’t be the case for him at present but, to humor you, if he were here with us real folks, he would find us too scary and go back to being Sechs with the other six and Snow White. Oh, and who says magic doesn’t work in our world? Magic, after all, is just another form of energy manipulation. I have an entire theory on magic and the other forms of human-manipulated energy. Fun stuff! And, for some further intrigue on this particular story, Snow White and the Seven Dwarfs I’ve tracked as being a German story. The other story they’ve blended with here involves critters and is a story from Austria, which Germany did invade in WWII. Know which story it is?